DESCRIPTION -- This item is a souvenir mug from the vessel The CP Voyageur of the Canadian Pacific Steamship Company. The souvenir mug is in a great condition and is original from the service. HISTORY -- CP Ships was a large Canadian container shipping company, prior to being taken over by Hapag Lloyd in late 2005. CP Ships had its head office in the City of Westminster in London and later in the City Place Gatwick development on the property of London Gatwick Airport in Crawley, West Sussex. The company became an independent corporation in 2001 when it was demerged by conglomerate Canadian Pacific Limited (CP) and is incorporated in Saint John, New Brunswick but headquartered in Greater London. Its 82 ships were registered in a number countries including the UK, Bermuda, Liberia, and Germany and most of the crews were Asian. Its primary ports remain Montreal and Vancouver. DESCRIPTION -- Unused souvenir tea-towel from the South African Marine Line shipping company and is in an as new condition and the size is 19" x 30" (48cm x 70cm) (click on the picture for a close up view). HISTORY -- Safmarine (South African Marine Corporation) was formed in 1946 by South African industrialists and American shipowners. In 1966 Safmarine became joint operators of the mail service from Southampton to South Africa with Union-Castle Line. As a result the Union-Castle ships Pretoria Castle and Transvaal Castle were transferred to Safmarine and, ultimately, the South African Flag. They became respectively S.A. Oranje and S.A. Vaal, and were painted in Safmarine colours. In 1973 British & Commonwealth Shipping Co. and Safmarine combined their operations under the name International Liner Services Ltd in October 1973. DESCRIPTION -- Fantastic find and is in a very good condition which is an original souvenir wooden cigarette case from the old shipping company The American Export-Isbrandtsen Lines. The front has a superb silver coloured embossed pattern and opens on a hinged lid. This item is difficult to date but is considered fairly old and the size is 5" x 4" (13cm x 10cm) (click on the picture for a close up view). HISTORY -- American Export-Isbrandtsen Lines, New York, was the leading US-flag shipping company between the US east coast and the Mediterranean from 1919 to 1977, offering both Cargo ship services and Passenger ship services, until declaring bankruptcy and was acquired by Farrell Lines, New York. DESCRIPTION -- Souvenir 'pinafore' from the Canadian Pacific Steamship Company and this item is in a fantastic condition and difficult to date but it realatively old. DESCRIPTION -- Great item of great interest and old and rare to find which is a set of 8 Ogden's Guinea Gold cigarette cards from the early 1900's showing maritime/military leaders of our time. The cards are in a very good condition and very collectable. HISTORY -- Beginning in 1875, cards depicting actresses, baseball players, Indian chiefs, and boxers were issued by the US-based Allen and Ginter tobacco company. These are considered to be some of the first cigarette cards. Other tobacco companies such as Goodwin & Co. soon followed suit. They first emerged in the US and the UK; then, eventually, in many other countries. DESCRIPTION -- This is an item produced for the Canadian/Union Royal Mail Line. It is a Time Table and Fares Guide for the shipping company and is dated 1935 (click on the picture for a larger opened up view of the item). Information is given on the sailings to and from Vancouver, San Francisco, Sydney and Melbourne to name but a few destinations and the item is in a great condition and original for the times. HISTORY -- Registered by James Huddart in 1893 as the Canadian-Australian Steam Ship Company, the shipping line was to operate a service between Sydney, Brisbane, Honolulu, Victoria, British Columbia (BC) and Vancouver, BC. The Brisbane call was abandoned in late 1893 and replaced by Suva, Fiji. From August,1897 the route became Sydney, Wellington, Suva, Honolulu, Victoria BC, Vancouver. The company was reconstituted as the Canadian-Australian Royal Mail Steam Ship Company under the joint control of James Huddart and the New Zealand Shipping Company who took complete control of the line in 1898. 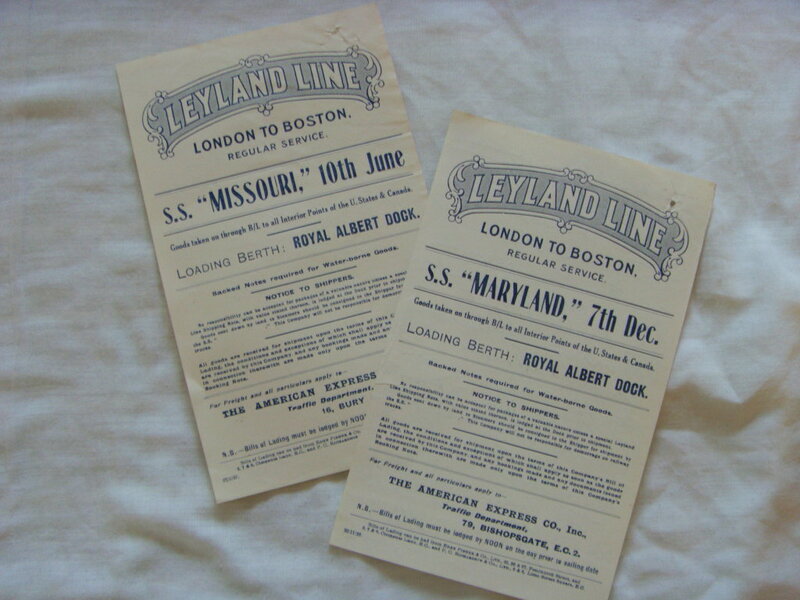 DESCRIPTION -- Pair of information 'Ships Notices' from the Leyland Line shipping company and are from 1927 & 1929. They show general freight service and shipping date information for vessel sailings between London and Boston USA and leaving from the famous Royal Albert Dock and both are in good condition with the size being 8" x 5" (20cm x 13cm). DESCRIPTION -- One of several items we are currently selling which is rare and hard to locate. It is an information 'Ships Notices' card from the Ellerman's Wilson Line and is from 1932. It shows general freight service and shipping date information for vessel sailings between London and Oslo for their vessel Dago and is in a good condition with the size being 7" x 5" (19cm x 13cm). HISTORY -- The "Dago" was a British Steamship built of iron at Sunderland, in the County of Durham, in the year 1878, and registered at the Port of Sunderland, her official number being 68,965. She was schooner rigged, her dimensions, as per register, being:ÃƒÆ’Ã‚Â¢€"Length, 283 ft.; breadth, 33.8 ft.; and depth of hold 24.8 ft., and of the registered tonnage of 1,239.17 tons, after deducting 674.98 tons on account of space required for crew and propelling power. DESCRIPTION -- This item is an as used on board type which is from The Manchester Liners company and is an ashtray and dates from the 1960's and the size of the item is 5" (12cm) long.